We vets see a lot of wounds (cat bite abscesses, skin cuts, abrasions, etc.) where well-intentioned pet owners have inadvertently slowed healing with the at-home care they’ve tried before bringing their pet in. How have they done this? By using something you likely have in your medicine cabinet, and something that many people sadly reach for as a first line of defense when cleaning and treating a wound on their cat or dog (or even on themselves). I’m talking about good ol' Hydrogen Peroxide. Unfortunately the bubbling you see when you add hydrogen peroxide to a scrape, bite, or cut isn’t just a sign that the peroxide is killing any bacteria that might be present, it’s also a sign that the peroxide is killing the very cells that your pet's body is counting on to heal the wound! These cells are called fibroblasts, and they are truly crucial to proper wound healing. So while the peroxide may be helping to disinfect the wound, it's unfortunately also slowing down the body's natural process for healing itself. Therefore peroxide is not the best way to clean or disinfect a wound. Fortunately, there are better ways that are just as simple, readily available, and not much more expensive. The best way to do initial cleaning of your cat or dog's wounds is to "flush" the area with a non-irritating substance that will clean the area thoroughly of any bacteria, fur, dirt, and other debris without damaging the cells and tissue in the area. Getting all of this "organic matter" out of the wound area won't just make it cleaner, but it'll also allow whatever disinfectant you use in the second step (see below) to work more effectively. Blood: If a wound is bleeding, you'll need to stop the bleeding before proceeding with cleaning the wound. Stopping bleeding is easy if you have a bottle of ClotIt around — this stuff is magic and works wonders on stopping bleeding in pet wounds, even heavy bleeding! But what if you don't have a bottle of ClotIt available? Attempt to stop the bleeding by applying direct pressure to the site and get to the vet immediately if a few minutes of direct pressure doesn't stop the bleeding. Fur: If possible and easy to do, it's nice to try and remove the fur from around your pet's wounds before cleaning them. This is because the fur around a wound is likely to (1) become soiled and mated with blood and debris, making it more difficult to keep the area cleaner, and (2) get stuck in your pet's wound, preventing it from healing fully and acting as a source of infection. To avoid cutting your pet's skin even further, don't use scissors (and don't use a razor) for this step. Instead, use a clipper (either electric or battery powered — like this one) to remove the fur from around your pet's wounds —it's far safer, and also more effective. And here's a "pro tip" for skin wounds that aren't too deep... put a bit of sterile, water-soluable lube in the wound before clipping the fur. (These small, single-use lube packets are perfect for pet first-aid kits!) This will help to prevent the clipped fur from sticking in the wound, and then both the lube and the clipped furs will wash out when you do the wound flush (next step). STEP 2 – Flush the Wound: Having a bottle (or two) of a sterile, pressurized saline "wound wash" in your pet's first-aid kit is a great idea. They're a quick, easy, and effective way to do a thorough initial cleaning of your pet's wounds because they easily generate the pressure necessary to remove debris and also dislodge bacteria from the damaged tissues. (Since they can also be used to clean your own wounds and are less expensive when bought in bulk, I recommend have more than one bottle lying around — and here's a good wound flush option.) If you don't have a sterile, pressurized saline wound wash, a good substitute would be a bottle of saline eye wash, like this one. STEP 3 – Disinfect the Wound: There are two great and readily available antiseptics for caring for pet wounds. They are Chlorhexidine diacetate* and Povidone iodine**, and I recommend you have a bottle of one (or both) around your home with pets. You don't want to use either of these at "full strength" though, they both need to be diluted*** for safest use. Chlorhexidine diacetate should be diluted to a 0.05% solution***, while the povidine iodine should be diluted to a 1% solution for safe and effective cleaning and disinfecting. You can either use some soaked gauze sponges to gently blot the area, or if you've got a syringe in your pet's first-aid kit, you can also use that to spray the diluted disinfecting solution onto the area under a bit of pressure (which can further help to dislodge any bacteria or debris that was missed in the previous "wound flushing" step). *Caution about Chlorhexidine: Chlorhexidine is available as both a "scrub" and a "solution," when using it as an antiseptic for your pet's wounds you want to be sure to use the "solution," not the scrub. Chlorhexidine is also available as both the "diacetate" salt and the "gluconate" salt, again, when using it as an antiseptic for your pet's wound care, use the "diacetate" salt and be sure to dilute to no more than a 0.05% solution. Concentrations of Chlorhexidine diacetate over 0.05% will, like hydrogen peroxide, damage skin cells. **Caution about Povidone iodine: Dilute to a 1% solution. Also note that some people can be allergic to povidone-iodine. ***Not sure how to do dilutions? Here's an easy-to-use dilution calculator to help you get it right. And, for safety sake when diluting, always add the chlorhexidine or iodine to the water, and not the other way around. Just in case of splash back, which can injure your eyes! So, there you have it, how to correctly clean and disinfect pet wounds, and why you ideally shouldn't use hydrogen peroxide to do so. But just remember... first aid is often just that, first aid. 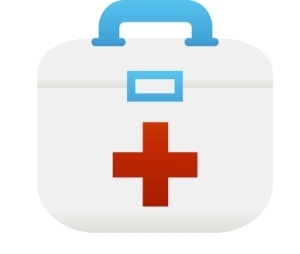 If your pet has suffered a bite wound, deep puncture, bad cut, or a nasty abscess, and you want to administer first aid, your next step, after cleaning, should be a visit to the vet. These types of injuries typically also require second aid... i.e., veterinary care! Wondering what you can use your bottle of hydrogen peroxide for on your pets? Don't worry, you need not throw it out. 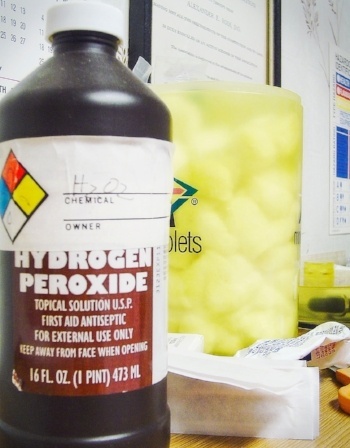 Poisoning or Toxicity: Hydrogen Peroxide is good to have on hand should you ever need to make your pet throw up at home (sometimes necessary when they eat a food or poison that they shoulnd't have — just don't use anything over 3% Hydrogen Peroxide for this and be careful with "Food-Grade" Hydrogen Peroxide). NOTE: In some instances vomiting can actually be more dangerous for your dog than the poison they've swallowd (e.g., burning again on the way back up through the esophagus, or getting into their lungs and causing pneumonia). With any poisoning emergency, call your veterinarian, your local Animal ER, or a dedicated pet poison control hotline before trying to make your dog vomit. They can let you know if making your pet vomit is safe and appropriate, and can help talk you through the procedure if needed. De-skunking: If you ever need to deskunk your pet (hydrogen peroxide is an ingredient in this great pet deskunking recipe).